I like a nice pale ale and that's what this is. 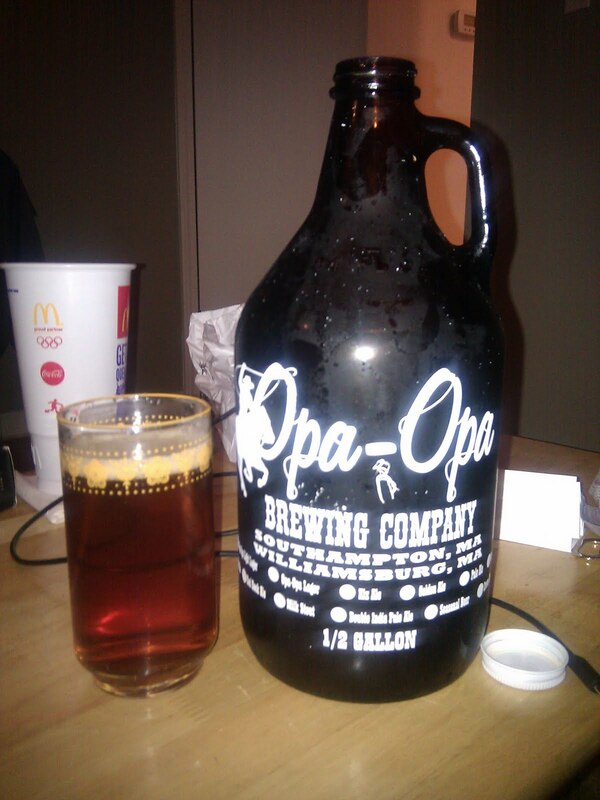 Opa-Opa Brewing company was reviewed here and all the information about the brewery can be read on there. The pale ale has an ABV of 5.4% and this growler, like the Brown Ale, cost $6.99 for a half gallon. I like reviewing growlers because I review the beer then I just get to drink the rest and not worry about writing anything; plus its economical and looks cool. She's a little hoppier than Sierra Nevada and Ballast Point's Yellowtail but not obnoxious like a Hop Wallop or anything like that. If you don't like hops, you probably don't like pale ales in the first place, but there are milder pale ales out there, however, their intention of this brew is to have a "snappy" aftertaste of hops. It's a delicious beer, that's for sure. Nothing about the smell is bad; smells like a typical pale ale. The taste is refreshing, leaving a hoppy bitter aftertaste that makes the mouth water. By no means is this, in my opinion, better than Sierra Nevada or Yellowtail but it is a very decent brew and I would get it again. It's cheap, it's good, and looks pretty cool when your carrying a jug of hooch around like a drunken hillbilly. Also, I read that the term growler came about when a man drank a few "growlers" one night and then he had church the next morning and boy was he growlin'! Okay. I made that part up.